stm32_vcp.zip – required to connect beacons/modems to the Dashboard via USB. It needs to be installed only once on your Windows PC. Other improvements: faster connectivity to the Dashboard over USB; improved blinking of beacons with lost radio connectivity; etc. New feature: CSV log file player. You can read tracks of mobile beacons recorded by the Dashboard into the CSV file and play it back directly in the Dashboard. You can choose exact time from the log, length of the track and even get some basic analytics, like: maximum speed, average speed, etc. New feature: Save Map/Load Map feature and buttons are active now. You can build a very complex map with submaps and save all settings for the map, submaps, and all beacons including their ultrasonic gain, triggers, etc. Since SW changes are pretty big with this release, please, use DFU for SW uploading. Future SW upgrades can be done with HEX, as usually. Important! Some earlier HW versions do not support all power saving modes. Use “Analog power in sleep” enabled first. It will increase power consumption by 5-8mA in active mode. If you happen to have a newer HW version, disable analog power in sleep. If system continues working normally – use it. It saves battery. Default mode – “disabled”, i.e. if your HW does not support it, the system won’t work stable. Important! Please, use addresses for beacons in the range of 2..63. There were reports that addresses 64..99 don’t always work well with SW v3.73. This bug has been fixed in the later versions. This is the easiest way to connect since no soldering is required and protocol is the same for different operating systems. SPI & UART interface pins on beacon board. The Python library provides quick and easy ability for integration of ultrasound navigation system with various linux-based devices. Among them are Raspberry Pi and other single-board PCs. This code is free to use in your applications (please include a reference link to this web page). Marvelmind ROS package – GitHub link. Please, check the instructions on ROS integration. 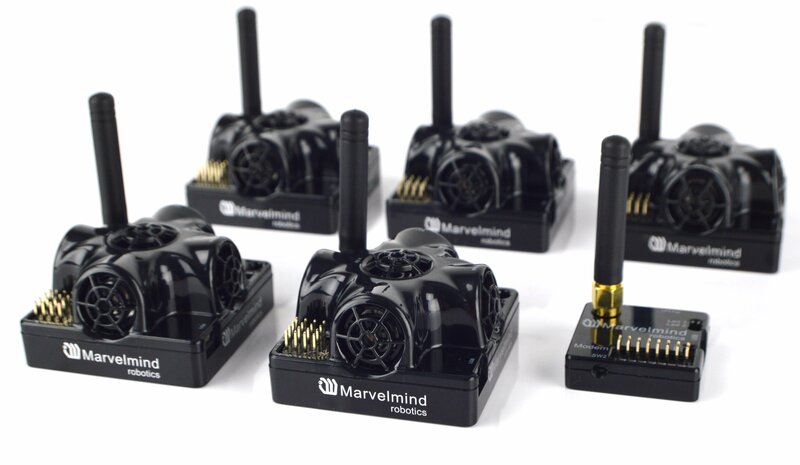 Here is a detailed PixHawk and Marvelmind Integration Manual. Please, also check the instructions on Pixhawk integration and description of interfacing via NMEA0183 protocol. Here is an explanation how to send path data via mobile beacon to your robot/copter sample code.